Timbi is a much beloved rhino. She arrived at Care for Wild Rhino Sanctuary in 2012 when her mother was shot in the Timbavati Nature Reserve bordering on the Kruger National Park. She was around 5 months old. Timbi didn’t have much competition for affection and was brought up by one of the managers at Care for Wild Rhino Sanctuary. She loved drinking her milk when she was still a baby, but now enjoys her green grass even more. Timbi is best friends with Olive, Hawk, and Forrest. 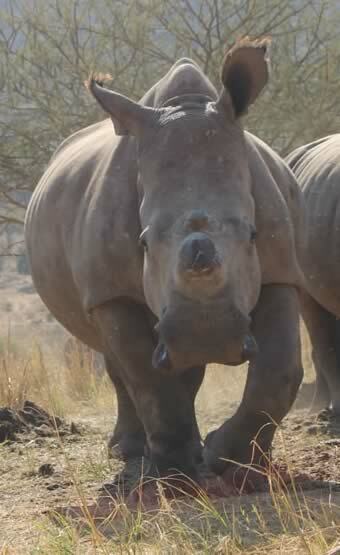 Timbi is the biggest orphaned rhino in her group and is protective of her friends. Since being released back into the wild together with a few other orphans, she has grown in confidence. They all enjoy the freedom to roam around as they please and graze in the large open spaces. Timbi especially loves rolling in the mud on a hot day in the bush.